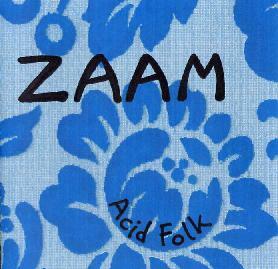 Zaam is mainly a duo act by a Belgian artist named Bert D'Hooge and a UK musician Mark C. Lee Riley. They are accompanied by Nigel on piano and harmonica on a few tracks. The tracks are quite long with 4 of 7 over 10 minutes. "Acid Folk" starts off the CD and is a dark ballad with acoustic guitar, piano and some nice electric guitar. "The Duke of Grantham" is a long (15 min) track. Riley sings this track, again a dark folk inspired track and cited as Riley/Traditional in the credits. "Spring and Sap" begins with a freaky organ before the dark emotion laden acoustic guitar strums in. I love the emotions evoked in the music and the excellent electric guitar. "Apathetic Bluesman" is a cool acid blues track. While neither of these guys are great singers, it works. "Beyond the Beyond" is some bizarre dueling spaced out guitar stuff. I don't know how to describe it. "Ketchup met Fritten" follows and a great story, with spoken words rather than singing, but the fuzzed out wah guitars and acoustic guitars all mix to make a psychedelic trip. A short organ based track, "Way Out", ends this excellent project. What really stands out about this music project is the excellent long drawn out emotional electric guitar solos. The way they weave in between the acoustic instruments and the way the stuff is mixed is really psychedelic and excellent. I enjoyed this CD tremendously and can't wait to hear more by these two guys! For more information you can email Zaam at: dhoogebertm@hotmail.com.